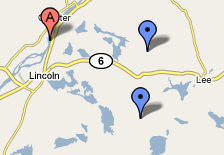 Rollins Wind - The Lincoln Maine Wind Project: What's your take on Rollins Wind thus far? If this project was good FirstWind would not have had to be so sneaky. The Town officials are corrupt and only see tax dollars to blow. They never have enough! Zoning? It is not permitted! The Town officials do not care they will approve it anyway. No appeals allowed! I hope they get sued royally. FirstWind Blows. This is not a wind farm, it is a tax subsidy plantation. Why ruin the beautiful Lincoln Lakes region for the profit of out of staters at taxpayers expense? If anything, the Town of Lincoln should say pay full taxes (rather than do a TIF)and a substantial impact fee, such as half the 2.1 cents per kilowatt hour of the Production Tax Credit these thieves will earn. First Wind would go prey on some other unsuspecting town then! Hooray for the Friends of Lincoln Lakes who are willing to speak out on this in a town where fear keeps many people silent.